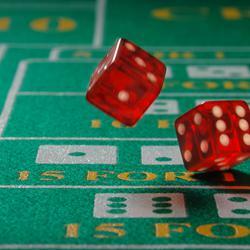 Craps is a game that can intimidate players at first sight. I know this because it took me more than a year to decide to give it a try, before it just seemed like an alien game that only some people played. Something that can be extremely intimidating is the multitude of bets available on the craps table when you start out, but all you need to do is focus mainly on the few common types of bets. Even if you are absolutely new to the game and everything seems like foreign land, there is no way that you cannot get around if you just take a look at the basic rules of craps. Any book or video with the basics of craps will be good enough to get you through your first encounters with the game. However, I also want to give you some tips as to how to make the right moves when you have just started playing. The easiest and most common bet in craps is the Pass Line bet and you can make this bet before the come-out roll or anytime before the point has been established. A recommendation is to never, NEVER, bet on the Don’t Pass Line, though it is a simple bet it is easy to track and the odds are on the bettor’s side. Always bet on the Pass Line and after doing this you can take “odds”. From there, I would suggest that you always, ALWAYS, take odds because when you take the odds on the Pass Line bet you are playing with the lowest house edge and it is adviceable to bet at least 5 times your Pass Line bets on the Odds. And finally, I recommend that you avoid the Horn bets. I know that the payout (30:1) sounds fantastic but the odds of two sixes being thrown on any given roll are 36:1 so you would only be giving the house a huge advantage. This is the same for all Horn bets so just stay away from them, there is no money for you there in the long run. The best tip that I can give for craps is to take it easy. It is not complicated at all, though I recognize the table may seem daunting, so you should be able to find your way around it and make some moeny if you follow these simple tips.